Hey there, I’m Ronja. I write code at Chasing Carrots. My focus has been on graphics programming lately (for about 1.5 years and counting). Trying to replicate reality, graphics styles of other media, or to generate new patterns that are difficult or impossible to generate in other media, is all super interesting to me. There are tons of tools to play around with for graphics programming or creative coding, which is the act of just making stuff to look or sound nice, without any other inherent use. There are a lot more tools, often even not specifically made for graphics programming. My personal focus is on writing shaders in Unity. Mainly because there is a friendly community around graphics programming in Unity, and because unity provides a framework that makes writing simple programs not too hard while still allowing us to write very complex setups with very advanced functionalities. 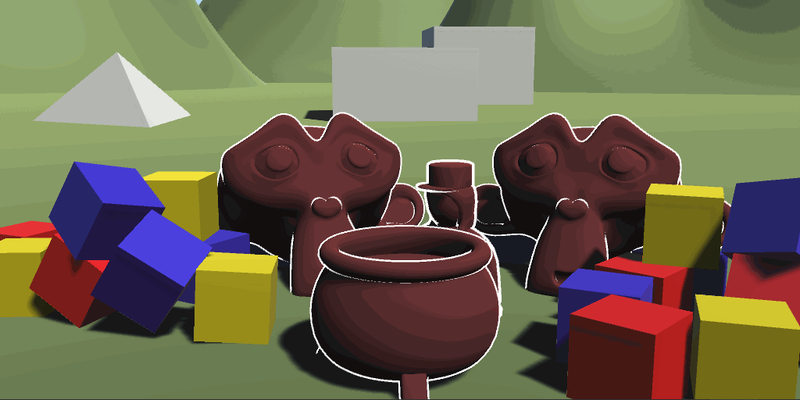 Another obvious advantage of Unity for me is that I’m able to use my shaders in the games I make. My personal journey to graphics programming and shaders began early last year when I joined the discord server of Joyce, also known as MinionsArt, who makes new shader tutorials every week (check her out!). Shortly after that I worked on a project for university and did some minor stuff to make the trees wave in the wind and animate the water. I quickly found the fun in shaders and started using them in places where I might not have needed them (for instance, I wrote a sprite animation system that’s mainly shader driven). And after that project I stuck to shaders, writing many more effects for many projects I was a part of. In March of this year there was a big event called GDC (game developer conference) I didn’t go to. At the same time though there was also a smaller online event happening called notGDC, by and for people who couldn’t/didn’t want to go to GDC, but still wanted some of the networking/knowledge gain you get when attending the conference. I joined that smaller notGDC event and decided to try to give back to the community I learned so much from by writing shader tutorials aimed at beginners. My plan was to have a tutorial for each piece of knowledge you need to understand the next tutorial, so I could always reference back to the old tutorials for people who want to learn a thing but don’t know the required basics yet. I managed to write 4 tutorials in 4 days for notGDC which set the start of a series of tutorials. From March to today I’ve managed to upload a new tutorial almost every week, only skipping a week when I was at an event (AMAZE). Each tutorial explains a new thing that’s useful to know about writing shaders. Since then, many people told me that they started learning shaders with my tutorials and that means a lot to me. So, if you want to check out my tutorials yourself, you can find my website here, or get in touch on Twitter. © 2019 Chasing Carrots. All Rights Reserved.